Historic Gold failed as a currency because Government debased the currency: the content of Gold/silver of the coins was lowered. Next we had a Gold Standard where Governments printed more receipts (currency) than there was Gold at an official fixed price and finally in 1971 the Gold window was abandoned. Money could from now on be created out of thin air…. Most don’t realize that since 1971 the monetary system has de-facto become a SELF DESTRUCTING entity and that it has become harder and harder to keep the patient alive. Because today’s monetary system is thriving on fiat currency, not even a balanced budget can solve the resolve the problem we are in. Politicians and Bankers have been playing God and society will pay dire for this. To understand why the system will collapse one must understand the implication of today’s money which is created out of thin air and the relationship between Money, Debt and Interest. You can create infinite quantities of money but only so much DEBT. As soon as the level of Debt gets too high Interest Rates always start to rise dramatically and the requested additional amount of fiat money which must be created to pay for this extra debt rises exponentially. This action always results in Hyperinflation. The currency system is imaginary, it doesn’t exist but it becomes real when you have to give it value. You have to work so you can pay tax which is used to pay the interest which has to be paid on the Bond issued by the Government out of nothing. Hence as more and more interest has to be paid. Government must collect more and more tax just to try to balance the budget. Balancing the budget in the end becomes impossible as the income falls (less tax income) and the expenditures rise because of the depression….and Authorities have yet to issue more debt/bonds. The Achilles heel of this imaginary system is the fact that INTEREST must be paid on the money created out of thin air and that this money doesn’t exist. Because of this each month MORE money/debt MUST be created in order to keep this currency system alive. In the end exponential amounts of money/debt must be created just to keep the system alive and this in turn leads to Hyperinflation.
" 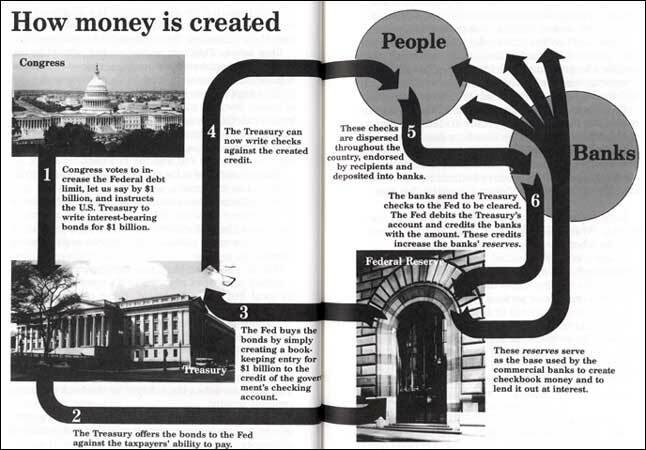 In a system of Fiat paper money the Reserve Bank only creates the Principal - not the usury or interest that it lends to the Government. Therefore the usury can NEVER be repaid and the end result is foreclosure and bankruptcy" . The end result is also bankruptcy and foreclosure for Governments. 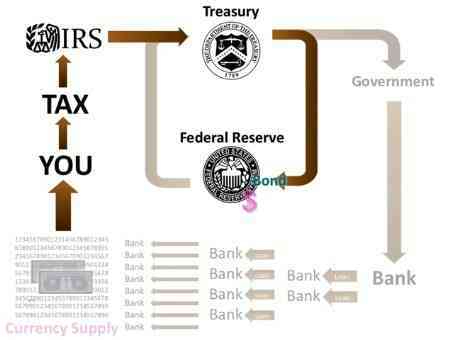 Because of Usury, Fiat money has to be created in an exponential way to cover the repayment of principal and interest. It is the exponential creation of fiat money which results in Hyperinflation and the collapse of the financial system. The negative consequences of Usury are minimum when the general level of interest rates is low (like today). Because the interest was not created but still has to be repaid, at a certain point, money becomes scarce and interest rates start to rise... exponentially! [this may help you to understand why Authorities are artificially keeping interest rates low]. Usury is a form of non-self-destructing credit. People create money by borrowing money from the bank to buy a home. The amount of money they create is the balance between the price of their Home minus the down payment plus the interest they have to pay. A Mortgage is NON-PRODUCTIVE and NON-SELF DESTRUCTING credit. Bad Money drives out the Good money but ultimately the Good money replaces the bad. Self-destructing credit is healthy for the Economy and Society as it is beneficial to the manufacturing process. It exists for the time of the manufacturing process only.